Today I’d like to share Alys and my “Oh the Places You’ll Go” display board for her 4th grade classroom for the 2013-2014 school year. Alys usually has welcome board that has all of her students’ names and pictures when you first walk into the classroom. The book is about a boy who goes off in a hot air balloon and sees the world. He passes through many strange lands and sees many strange people/animals on his great journey. 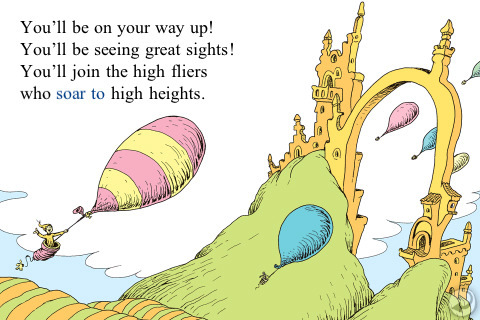 The end is very cheerfully open ended and shows a picture of the boy flying away in his hot air balloon alongside other explorers. Alys wanted to recreate the hot air balloon scene in Dr. Seuss style with bright colors and lots of creativity. Alys had the brilliant idea of printing and cutting out small pictures of the childrens’ faces to personalize the hot air balloon explorers. The kids absolutely loved this part and had a lot of fun finding themselves on the display and comparing their balloons’ colors and positions on the board. Here is a closeup of one of the hot air balloon explorers – super cute! Overall, Alys and I both enjoyed this project so much and the final product was very rewarding. Everything turned out better than expected and the class enjoyed seeing themselves up on the board all year long. Thanks for checking out our latest project, and I hope to post more fun stuff very soon!